I admit, I get caught up with the hustle and bustle of December. Wanting the Holidays to be beautiful and perfect in every way. If you are anything like me, each year you vow to make this holiday season more simple, more organized and less stressful. 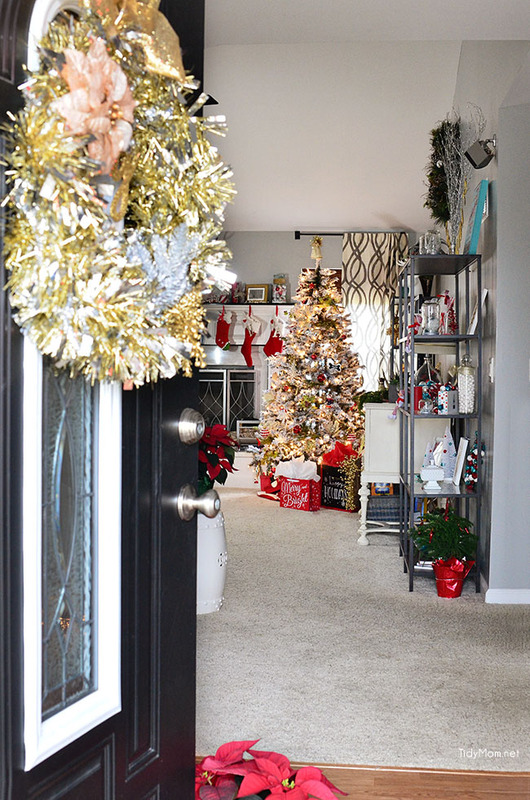 If you are hosting out of town guests or a holiday party, I have few Holiday Cleaning Tips to help you prepare for the holidays, so you can enjoy friends, family and your home . There is no time of year when I love my house and enjoy being home–more than during the Holidays. There is just something magical about the twinkling Christmas tree lights and sparkly festive decor. I love cuddling up on the couch with a mug of hot chocolate , a crackling fire, lit Christmas tree and watch one of our favorite holiday classics. But you know what totally ruins my chill and Holiday spirit? ……….a messy house. I’ve said it before, and I’ll say it again, Clean Feels Good! nothing puts me in a better mood than a clean home. Turn on a Christmas playlist and let’s get started! Your holiday to-do list is probably endless…..am I right? Finding time to clean and what to clean is probably not as bad as you think. Begin with the simple things. A tidy home looks cleaner than a cluttered home. So without any cleaning at all, you can make a much better impression on guests if you take some time to grab a laundry basket and pick up all that stuff that belongs elsewhere. 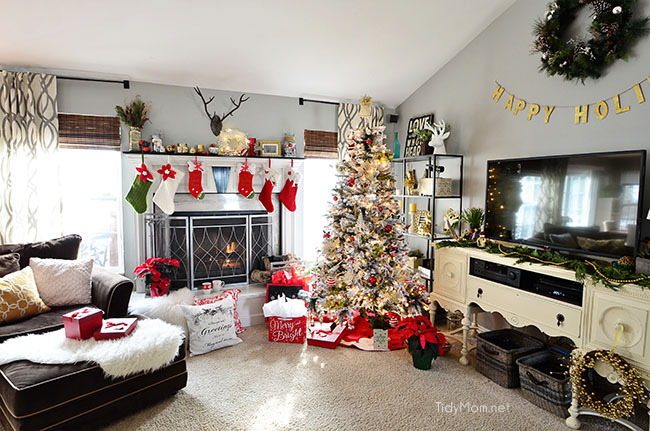 Holiday Cleaning Tip: Move from left to right around the room (do this when picking up and cleaning). This helps you to remember everything behind you is now considered a clean, clutter-free zone and everything ahead of you requires attention. When you are ready to start cleaning, if you can, space it out over a few days and start in the most important, or difficult, room in your home. Prioritizing your room ensures you get the most meaningful rooms done first — so if you run out of time, you’ll still be ok.
Clean range or stove top, surfaces, and grates. Wipe down all large and small appliances. Create space in the kitchen for holiday entertaining by filling a box with kitchen items you won’t be using and moving it elsewhere. Now you have room for the holiday serving dishes, punch bowl, grandma’s silver and other items you’ll be using during the holidays. 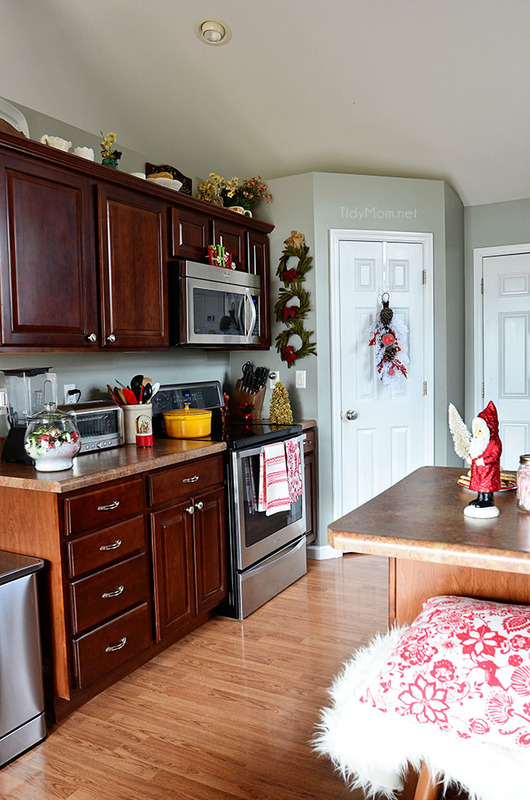 I feel much more organized when I start my holiday baking with a clean and organized kitchen. Tell me I’m not the only one who will clean the kitchen even before I start baking?! And, just like I have to do dinner dishes as soon as we finish eating, I always clean up the kitchen when I finish baking. By cleaning the kitchen before I start, not only keeps me more organized, but there’s less clean up when I’m finished = less stress. #CleanFeelsGood moment. Most importantly, make sure the entire bathroom is squeaky clean. Place a basket in the bathroom with little amenities your guests may have forgotten to pack, such as cotton swabs, toothpaste, a toothbrush, hairspray, ibuprofen and more. Even the most organized travelers will forget something. Stock shower with shampoo, conditioner, soap and a razor. Brighten up the bath with fresh flowers, scented soaps and holiday decor. Stock bath towels, washcloths and hand towels. I like to splurge on a few thick, 100 percent cotton towels (watch for clearance sales) in a color different from our regular towels, so we always have the “good” towels ready for guests. Fill a tub side bin with an assortment of sponges, bath salts, loofahs, bath brushes along with scented soaps and lotions to treat your guests to a spa-like experience. If space allows, provide guests with a basket or bin for stashing used towels and linens. Uses herbs like lavender and chamomile to freshen your home. Fill a spray bottle with 20 drops of lavender essential oil, 1 teaspoon vodka and water to create a linen spray. Lavender is known to reduce stress, promote calm and aide in relaxation. Mist bed linens, lamp shades, shower curtains and drapes. Grind up lavender and chamomile with baking soda in a food processor to sprinkle on rugs and carpets to remove odor. Just leave overnight and vacuum the next day. Holiday Cleaning Tip: choose essential oils in holiday scents, like peppermint or pine, to spray sofas and drapes other living spaces. Send your invites early: This will help you budget for food, time, chairs, dinnerware etc. Choose your menu well in advance: Go through traditional family recipes, cookbooks, or visiting your favorite food blog, or websites for ideas. If choosing a potluck, make a list of what type of food you’d like guests to bring and let them know once they accept the invitation. Start by removing everything from your dining room table and giving it a good scrub down or polish. Plan and wash dinnerware, glassware, serving ware, table linens (table runner or table cloth, napkins). If you need to shine silver flatware, do it now too. After you have all your supplies, lay them out on your table to get an idea of what they look like together. Grab a couple chargers and place them in front of each chair. Go with plain chargers and then get decorative with the plates, glasses and napkins. Now that you have the basics covered, its time to add all the details! Grab some holiday touches; holiday candles, ornaments, fresh pine and other seasonal decorations. Spread them out across your table however you like. 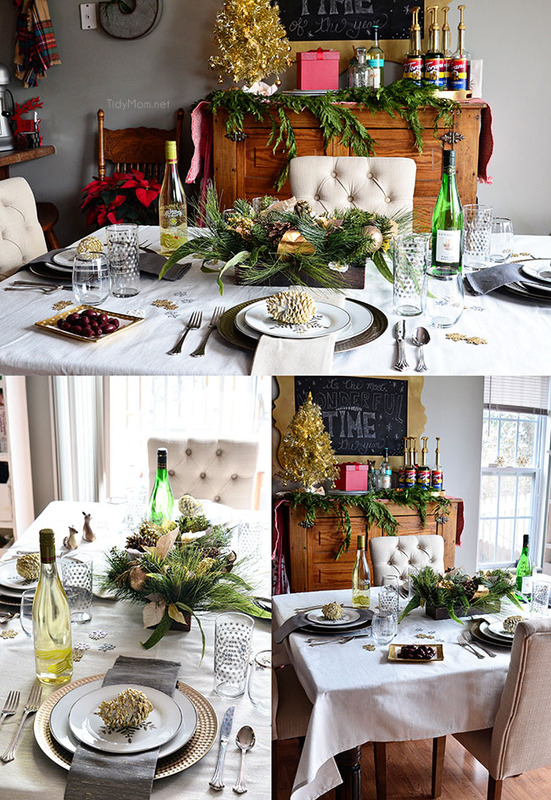 Add more, move things around, make your holiday tablescape perfectly you! 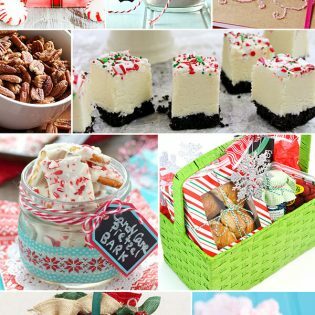 If you are a type A (like me) you might like to take the honor of making and planning the entire holiday gathering. Things will run much smoother and be less stressful if you have some help. People often WANT to help! Just ask. If your uncle is good at cutting the turkey, ask him if he can arrive a little early to cut and plate it. Older kids and teens can help bring out chairs, and take guests jackets as they arrive. Remember, you want to enjoy the day as well. You don’t have to get up at the crack of dawn to do all of the cooking and baking on the day of the event. Many vegetable side dishes, casseroles and desserts can be made in advance and kept in the refrigerator or freezer. The holidays only come around once a year, cherish those around you, and give thanks for having loved ones near. Remember, be flexible in your plans, life happens and unforeseen holiday challenges may arise. With a little planning though, your guests will enjoy your company, holiday home and meal. Keep the memories not the mess. 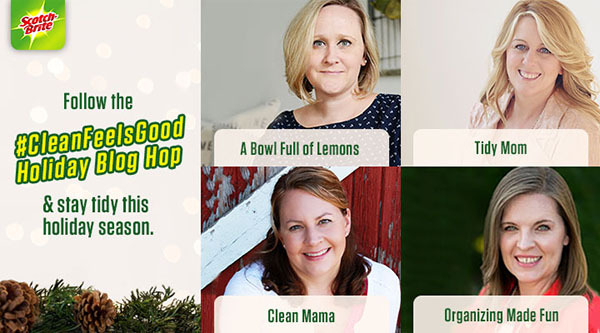 I have joined forces with Scotch-Brite and three other bloggers to bring you a Clean Feels Good Holiday Blog Hop ! Fun right?! I so need these tips! My house becomes a disaster in exactly 8.62 seconds! I need to stay on top of things! I love this! 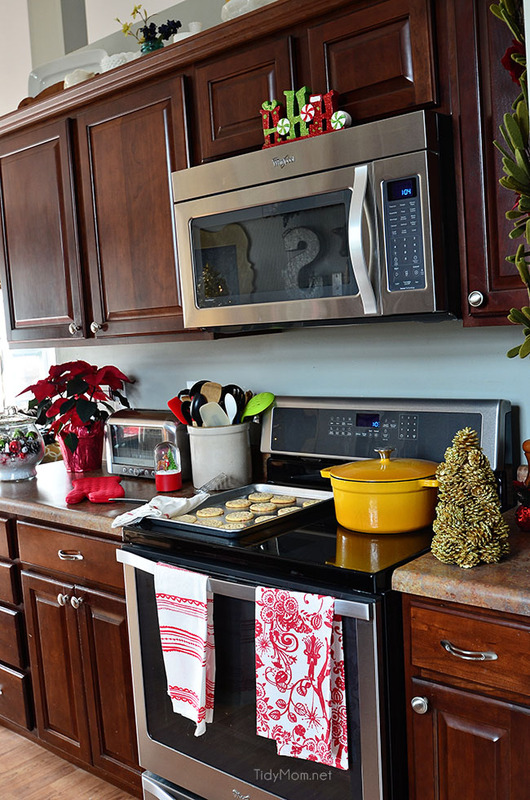 Your home is gorgeous and I love the picture of the cookies on the stove. So homey! Great tips! !Your home looks beautiful. I always get a little crazy over the holidays with all the decor out and the schedules. I will be using these tips!! Oh my goodness, Cheryl! Your house is gorgeous! Love your sense of style, so much! Thanks for the cleaning tips! I’m tackling my house today, while the kids are at school!! This is perfect. I will definitely give it to Jack! He loves lists. This will make his day! Clean does feel good, there’s nothing better than enjoying your home after a good clean and yours is beautifully decorated and so festive! Such great tips! Now I need to put them into action. 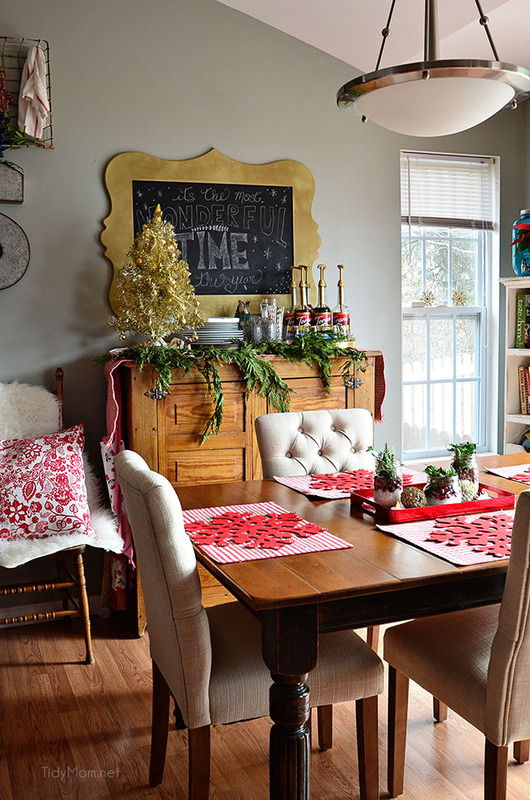 My house is a mess and I love for it to be clutter free for Christmas so I can relax! Your home is gorgeous! Your house is beautiful! 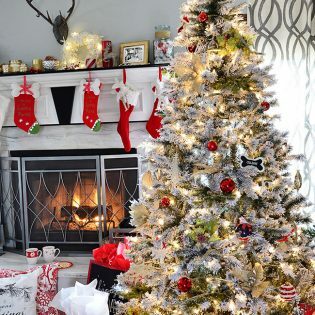 I’m in love with all your Christmas decor! Those are great tips, Cheryl! If I don’t clean my house regularly, it quickly becomes a disaster. Your house is very lovely! Did you decorate it, or did you hire a professional? I’m in love with your kitchen table chairs! Lovely tips! I’m in the midst of my big pre-holiday cleaning and your post gave me very good ideas how to finish it. Love your decoration, I’m about to start with that soon. This year I have big plans for decorating and hope I’ll be done on time. Greets! Perfect! Your holiday cleaning tips are so good. All the tips are so easy to follow. Thanks!